Miller Oberman is changing the landscape of contemporary poetry. This collection is unlike any book I've ever read. A hybrid of original poems and Old English translations, The Unstill Ones is a magnificent rumination on everything from Medieval motherhood to the trans identity. 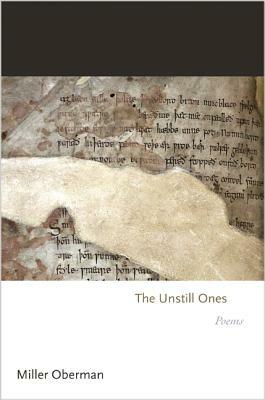 An exciting debut collection of original poems and translations from Old English, The Unstill Ones takes readers into a timeless, shadow-filled world where new poems sound ancient, and ancient poems sound new. Award-winning scholar-poet Miller Oberman's startlingly fresh translations of well-known and less familiar Old English poems often move between archaic and contemporary diction, while his original poems frequently draw on a compressed, tactile Old English lexicon and the powerful formal qualities of medieval verse. Shaped by Oberman's scholarly training in poetry, medieval language, translation, and queer theory, these remarkable poems explore sites of damage and transformation, both new and ancient. "Wulf and Eadwacer," a radical new translation of a thousand-year-old lyric, merges scholarly practice with a queer- and feminist-inspired rendering, while original poems such as "On Trans" draw lyrical connections between multiple processes of change and boundary crossing, from translation to transgender identity. Richly combining scholarly rigor, a finely tuned contemporary aesthetic, and an inventiveness that springs from a deep knowledge of the earliest forms of English, The Unstill Ones marks the emergence of a major new voice in poetry. Miller Oberman has received a number of awards for his poetry, including a Ruth Lilly Fellowship, a 92Y Discovery Prize, and Poetry magazine's John Frederick Nims Memorial Prize for Translation. His work has appeared in Poetry, London Review of Books, the Nation, Boston Review, Tin House, and Harvard Review. He lives in Brooklyn, New York.